Teranex AV is specifically designed with new features for live events and professional AV installations, as well as broadcast and post production workflows. You get 1,089 up, down, cross and standards conversions for all formats up to 2160p60, along with Teranex’s patented algorithms and legendary image quality. Deliberately designed with new features in mind, the Blackmagic Design Teranex AV Standard Converter is ideal for live events and professional AV installations, as well as broadcast and post production workflows. Along with Teranex’s patented algorithms and notoriously brilliant image quality, users are provided with 1,089 up, down, cross and standards conversions for all formats up to 2160p60. Capable of generating a reference signal and offering low latency, the Blackmagic Design Teranex AV also delivers a still store for adding logos and graphics and a live freeze frame. 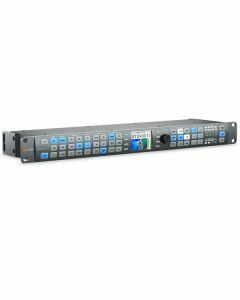 In addition, the standard converter offers consumer HiFi, XLR audio, HDMI in, loop and outputs as well as professional 12G-SDI and quad SDI connections which can be used simultaneously. To avoid cables and connections from deteriorating when installed in tight locations, metal brackets are installed to the rear. The Blackmagic Design Teranex AV makes it possible to convert any HDMI or SDI video format instantaneously and output it for projection in sync with a live event because it features latency as low as 67 milliseconds. For instance, the Teranex AV could be deployed at a concert to project a close up of a virtuoso lead guitarist, as their fingers fly across the fret board, on a big screen projector in synchronisation with the live performance. As far as audio is concerned, Teranex AV features two channel consumer HiFi connections (which are crucial), as well as XLR connections for 4 channels of AES/EBU or two channels of balanced analogue audio. This means that lapel microphones, laptop computers and other devices with consumer audio connections to be used with Teranex AV. You can connect virtually any audio source to Blackmagic Design's Teranex AV and use it to embed the audio with the video and output the signal in any format.